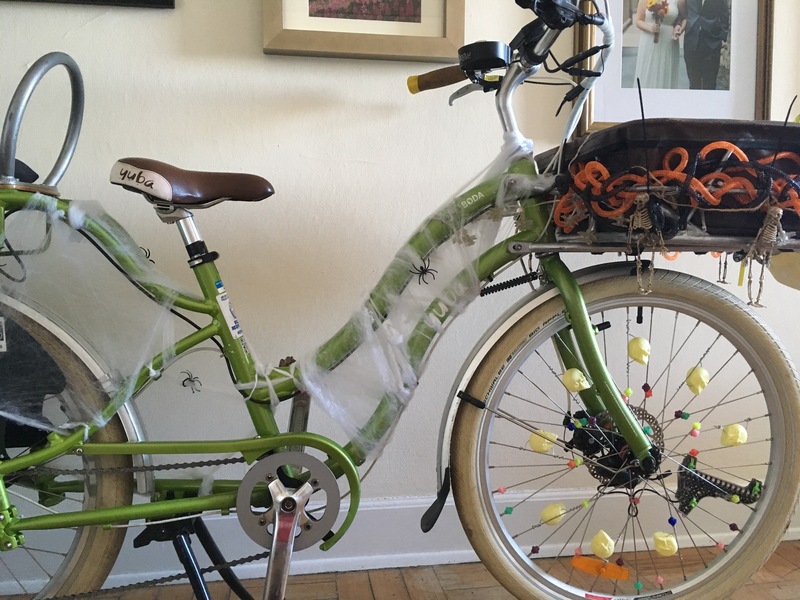 Bike Decorating: Halloween 2016 – Lindsey Bikes! Thursday was the first day of fall! And you know what that means, right? We dug the decorations box out of the storage unit to find that I didn’t actually pack most of my bike decor. The only item I had left was the skeleton garland & that just would not be festive enough by itself! I struck out on decor at the art store so I headed over to the Dollar Tree to find some goodies. I wanted to change it up with decor for both Halloween & Thanksgiving and the price was right! I found orange & black mesh tubing that I wove through the basket. I tied the ends in the back so no zip-ties needed. I also picked up a new plastic skull as a centerpiece. I poked two holes in the back & added a piece of wire then zip tied it to the front the of the basket. I’m hoping it won’t rip off like last year but I’m doubtful since it’s not very sturdy. 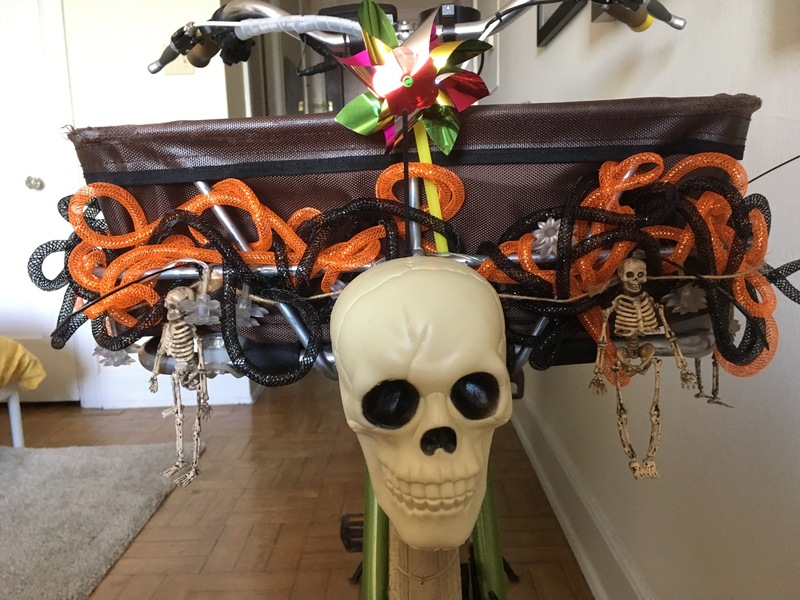 I added the skeleton garland from last year & zip tied each skeleton on so they wouldn’t hang down too far & dangle close to the wheel. 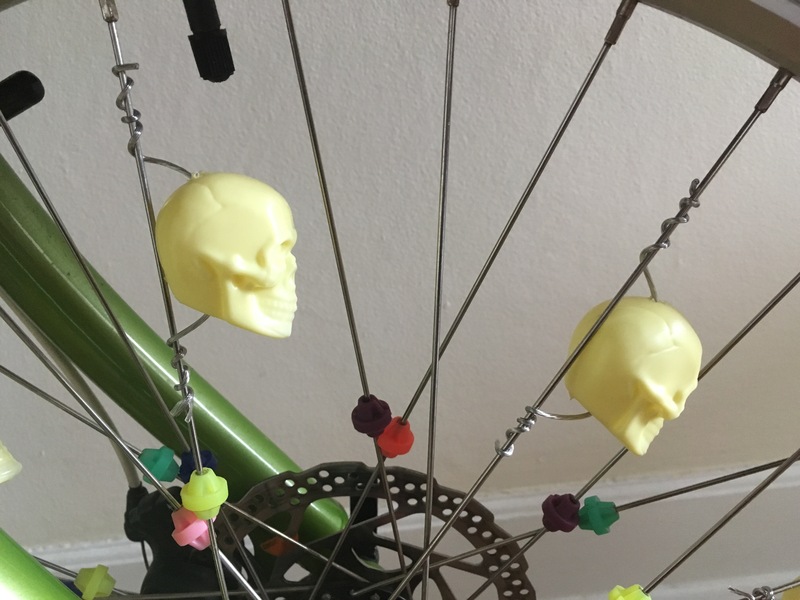 For additional skull action I made spoke skulls! 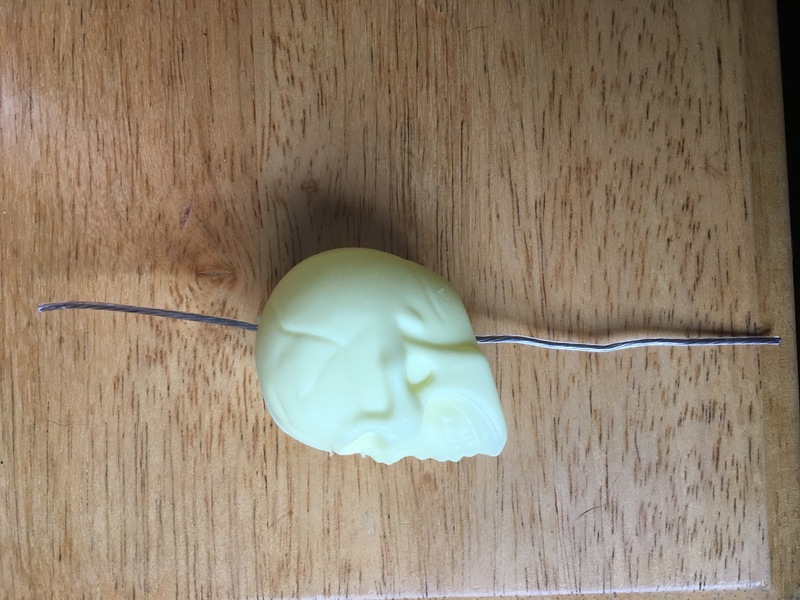 I poked a hole in the top of the plastic skull & then threaded wire through the hole in the top & the pre-cut hole in the bottom. I twisted the wire around the spoke so they’ll stay mounted up & down. Very easy to steal, so we’ll see if these last very long. In a bout of overkill I also added spiderwebs to the frame with little plastic spider sprinkled in for good measure. I don’t know how long it’ll last since it’s pretty fragile but I have plenty leftover if I need to add more. We also hung up our Halloween gel clings that look like dripping blood so our windows look awesome. The only thing left is to put up the orange & purple lights I got & our tiny apartment will be transformed into a spooky murder den. Yay!